Fig. 11-31. Arc-Length Uncertainties of Single-Frame Attitude Solutions for Data Pass of Fip. 11-29 and 11-30.
. Because the existence of systematic errors can be recognized from the behavior of solutions near singularities, it is important to determine the singularity conditions for the commonly used attitude determination methods. T he general expression of the attitude uncertainty given by Eq.^l 1-36) shows that attitude uncertainty approaches infinity only under two conditions: (1) when the measurement density, dm or d„, approaches zero, or (2) when the correlation angle, ©m/„, approaches 0 or 180 deg, i.e., when sin©m ,n =0. 1. Sun Angle/Nadir Angle (j8/ij) Method. The only singularity for this method occurs when 0^=0 or 180 deg. From Fig. 11-18, this occurs when the attitude lies on the Sun/Earth great circle, that is, when the Sun vector, the nadir vector, and attitude are coplanar. This singularity condition can be generally applied to any method using two arc-length measurements relative to two known* reference vectors to determine a third unknown vector direction. A singularity always occurs when the unknown vector is coplanar with the two reference vectors. 2. Sun Angle/Earth-Width (j8/fi) Method. Because the correlation angle here is the same as that for the p/r\ method, the singularity condition above also applies here. However, an additional singularity exists due to the measurement density of Q. From Eq. (11-40), da = 0 when cot y = cot ij cos 8/2. This is the condition for which the dihedral angles A EH, and AEH0 equal 90 deg, that is, at maximum Earth width for constant p.
3. Sun Angle/Rotation Angle (j8/4>) Method. Two types of singularities exist for this method. The singularity due to the correlation angle is most easily obtained from Fig. 11-18, from which, 0^/®=O or 180 deg when the attitude lies on the Earth/Null great circle, that is, when the nadir vector, the null, and the attitude are coplanar. From Eq. (11-46), the singularity due to low rotation angle density occurs when either simp or sin£ equals zero, that is, when the nadir vector is parallel or antiparallel to the Sun vector or when the attitude is parallel or antiparallel to the null. 4. Nadir Angle/Rotation Angle (i}/4>) Method. The singularity conditions for this method are similar to those for the y9/4> method except that here the correlation angle equals 0 or 180 deg when the attitude lies along the Sun/null great circle; that is, wjjen the Sun vector, the null, and the attitude are coplanar. 5. Earth-Width/Rotation Angle (8/4») Method. Singularities in this method come from three sources: the high correlation between ft and $ or the low measurement density of either 8 or 4». The singularity condition due to the low measurement density for Q is given in the j8/ii method, and those due to the other two sources are the same as those given in the ij/4> method. •The critical nature of this condition is discussed below (and in Section 10.4) in terms of the unknown horizon crossing vector as an attitude reference. angle measurement is a compound data type because the horizon vector is not a known vector but rather is determined from the Sun angle and the rotation angle measurements. Therefore, the equations given in Table 11-2 cannot be directly applied to this method to identify the singularities. However, the singularity conditions for this method can be obtained by considering the attitude determination procedures described in detail in Section 11.1.2. Three steps are involved in attitude determination in the fi/QH method: the computation of ipH from y, /? 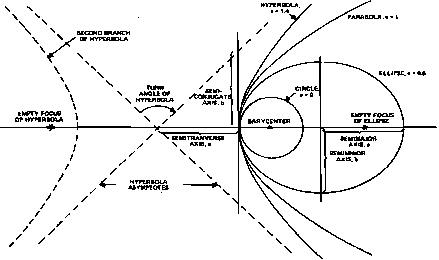 and <bH\ the determination of the horizon vector from the arc-length angles rpH and p relative to the Sun and the Earth, respectively; and the determination of attitude using ¡3 and y. The first step is a direct application of the cosine law for spherical triangles and gives no singularities. The second step causes a singularity when the Sun vector, the nadir vector, and the horizon vector are coplanar as a result of the general rule discussed in the /8/tj method. However, this rule cannot be applied to the third step because the horizon vector is not a known reference vector but is determined from the knowledge of the rotation angle, In other words, the third step not only uses the values of ¡3 and y, but also implicitly uses the value of Because the singularity condition for the ¡3/y method in general provides good geometry for methods using with all three data items (P,y and i>w) available, step three will not introduce any attitude determination singularity. Thus, the only singularity condition for the fi/$>H method occurs when the Sun vector, the nadir vector, and the horizon vector are coplanar. This is confirmed by examining Figs. 10-15 and 10-16 and noting that the ¡3/<bH correlation angle singularity occurs when small circles centered on the Sun are tangent to the <bH attitude loci. This occurs at the points labeled A on Figs. 10-15 and 10-16. Table 11-3 summarizes the singularity conditions for all methods discussed in this section. Singularity conditions for other attitude determination methods can be obtained in the same manner by analyzing the data types, the measurement densities, and the correlation angles.